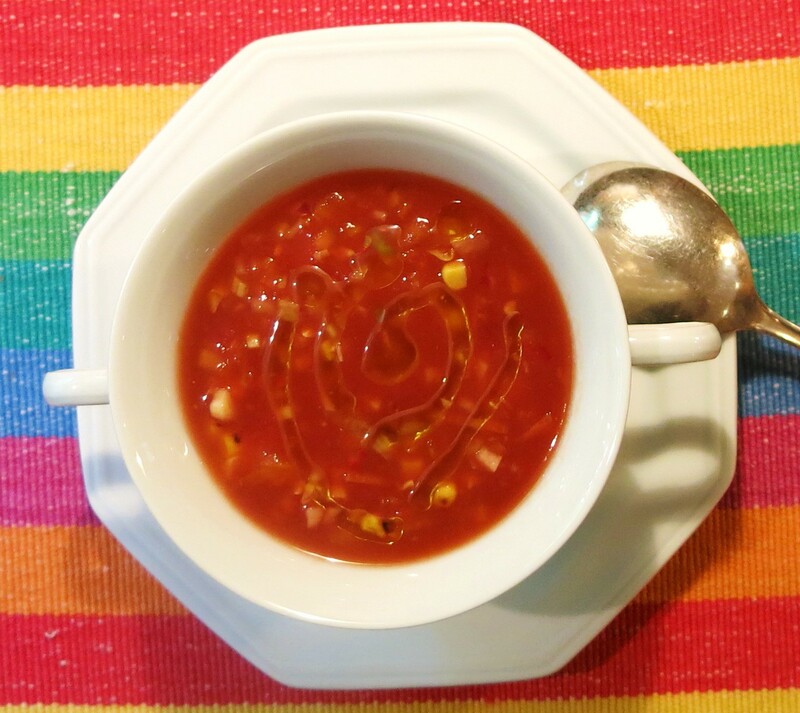 Gazpacho is the perfect summer soup. In Andalusia, it’s smooth, unctuous and creamy. The Goddess loves that version. She could bathe in that version. But, she’s also just a tad unconventional, so she also really likes a slightly chunkier version with bits of crunchy vegetables, too. That’s what this is! If you prefer the smoother, creamier version, then you might like the version from the New York Times food column. It is delicious and easy, as well. I just prefer the chunkier, more eat-with-a-spoon-type of gazpacho. Choices are good to have! With all the garden veggies coming in by the bushel, this is perfect for a light lunch or dinner. It is particularly welcome on the recent steamy, hot days of summer. We’re really looking at soup and salad in one preparation, aren’t we? I love the crunch of this chunkier version. I think that’s what appeals to me most, the texture. This is particularly the case, if this is going to be your dinner, which The Goddess will absolutely be serving with Catalan Tomato Bread! It’s tomato season, people…use them to their fullest and most flavorful, fantastic extent. To peel the tomatoes: Cut a cross in the bottom of each tomato and then, using a slotted spoon, plunge into the boiling water for a minute or two—the peel will slip off easily. 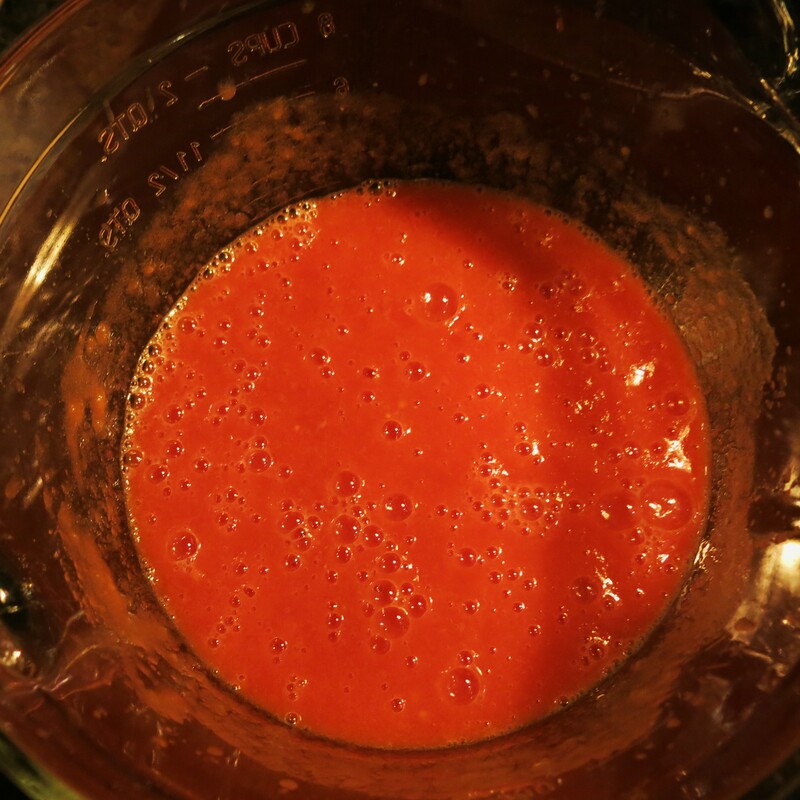 Cut the 6 of the peeled tomatoes into chunks and puree them in a food processor. The tomato puree should be very fine—almost liquefied. Place the puréed tomatoes in a large bowl; add the reserved diced tomatoes. Add the finely diced onion, green pepper, red pepper, jalapeno pepper, cucumber and pressed garlic. Give it a good stir until everything is combined. Add the salt, cumin, lemon juice and vinegar; stir until well combined. If needed, add enough tomato juice to thin the soup to the desired consistency—it should be soupy, not thick. Refrigerate in a large pitcher for at least 4 hours; serve very cold, drizzled with olive oil and Catalan Tomato Bread on the side. NOTE: This can also be served with finely chopped cooked shrimp, lobster and crabmeat for a complete summer dinner. I have added the kernels cut from 1 ear of cooked corn and 1 small carrot, finely shredded. You may substitute unpeeled zucchini for the cucumber, but you will have a different flavor profile. 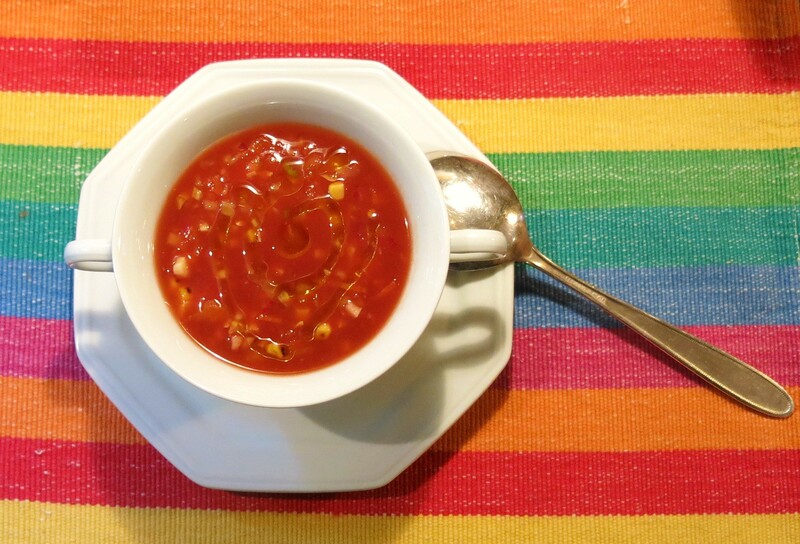 Gazpacho, Not-So-Spanish-Style Recipe©Marcia Lahens 2015. All rights reserved. 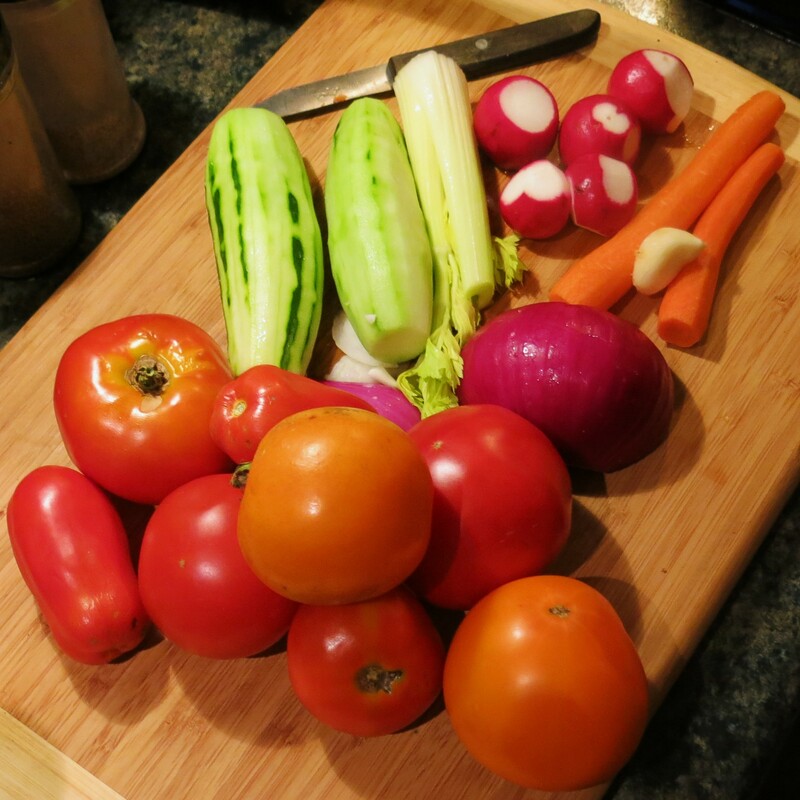 I dice all the veggies, except the tomatoes (I actually do reserve 2 that I dice finely), into a very fine dice. I try to keep the dice the same size, about 1/8-inch dice or brunoise. I use my handy, dandy immersion blender to purée the remaining tomatoes to a nice smoothness. 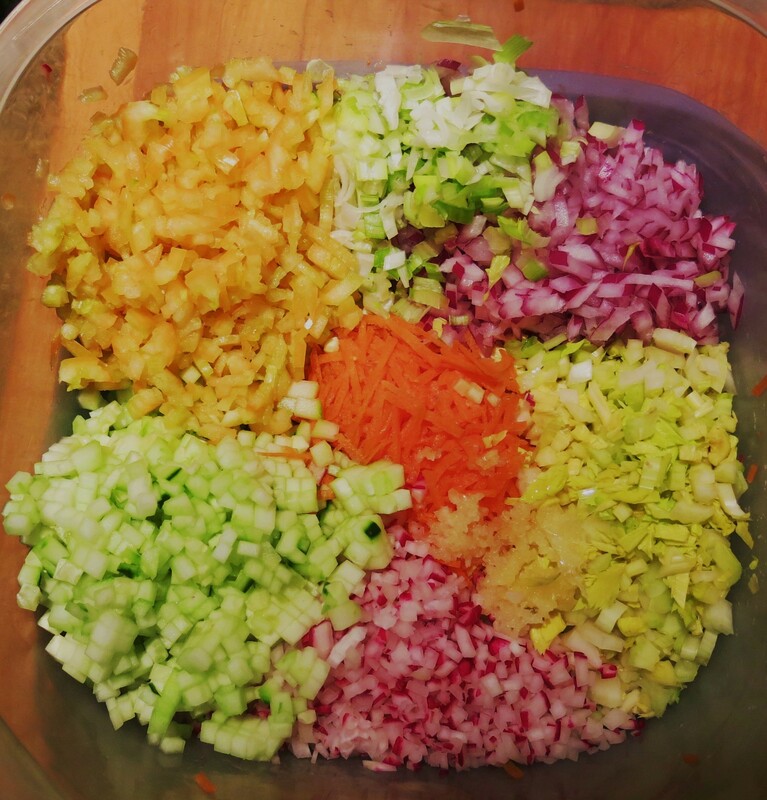 Stir in the diced veggies, taste and correct the seasoning. You may need to add more acid (either lemon juice or sherry vinegar), salt or just a drizzle of honey. Stir it up, cover the container and chill for at least 6 hours or overnight. Gazpacho should be served icy cold. I serve each bowl or cup, with a drizzle of my best flavored olive oil. Right now that’s the Spanish olive oil, Basilippo. You can also toss a few small croutons on each bowl, if that floats your boat. And to make it a complete meal, toss in some diced cooked shrimp or lobster. This is how you enjoy the fruits of the summer garden at their absolute best!